Amatrol’s Alternative Energy Learning System –Solar (850-AES) teaches aspiring solar technicians the knowledge and skills they need to prepare for portions of the solar certifications offered by such certifying groups as NABCEP (North American Board of Certified Energy Practitioners) and ETA (Electronics Technicians Association). The demand for qualified solar technicians continues to rise, as consumers and businesses turn to solar energy in their communities. This green energy training system includes a mobile workstation with real-world solar components. The interactive curriculum teaches vital, hands-on skills necessary for career success, such as system connection, operation, and programming of solar PV (photovoltaic) systems in commercial and residential applications. To complete the system, users must add a Solar PV Array Station (85-SPA1) (or an equivalent station with an input power range of 43-200W) and a Solar PV Sun Simulator (85-SPS1). Amatrol’s Alternative Energy Solar System features real-world components that allow learners to build job-ready skills useful in both commercial and residential settings. For example, a combiner box with a multiple-panel solar array allows learners to connect panels in series and parallel, while an MPPT charge controller allows programming and communications from an LCD panel. The system’s solar circuits can also be used either indoors with a sun simulator or outdoors via a detachable solar panel array or client-supplied external solar source. The solar energy training system can also be connected to client-supplied roof-top solar panels with the addition of optional interface connections. Amatrol’s curriculum features a highly-interactive, multimedia format that includes stunning 3D graphics and videos, voiceovers of all text, and interactive quizzes and exercises designed to appeal to learners with different learning styles. The solar energy training curriculum teaches learners about photovoltaic modules and arrays, solar batteries, and solar photovoltaic systems. For example, learners will study solar battery charging and gain experience connecting a charge controller and adjusting its settings. The combination of theoretical knowledge and hands-on skills solidifies understanding and creates a strong basis for pursuing more advanced skills. 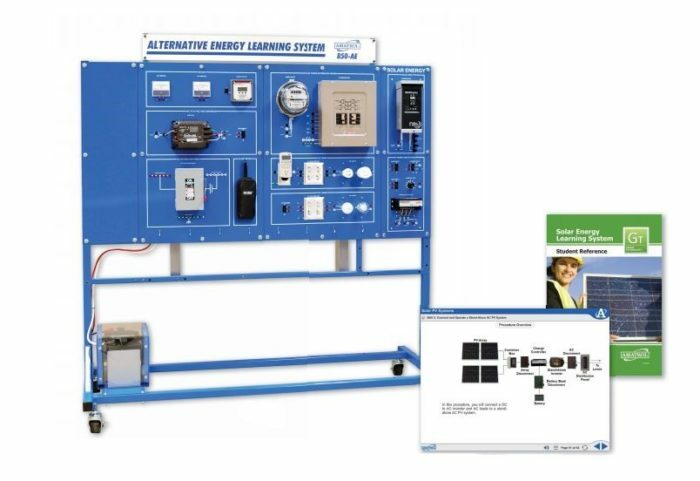 The solar energy system offers additional learning opportunities through optional learning systems, such as a Wind Energy (85-WE), Data Acquisition (85-ADA1), and Grid-Tie (85-GT1). Each option features its own hardware and additional curriculum. A sample copy of the Solar Energy Learning System Student Reference Guide is also included with the system for your evaluation. Sourced from the system’s curriculum, the Student Reference Guide takes the entire series’ technical content contained in the learning objectives and combines them into one perfectly-bound book. Student Reference Guides supplement this course by providing a condensed, inexpensive reference tool that learners will find invaluable once they finish their training, making it the perfect course takeaway.